Starting from the pole in his No. 51 Cessna Tundra, Kyle Busch led 43 of 60 laps in the Gander Outdoors 150 at Pocono Raceway to take the checkered flag and earn not only his second NCWTS win this season, but his 51st career win in the series to tie the all-time win record set by Ron Hornaday Jr.
Busch started the day by capturing his 21st career-pole in the NCWTS. He took the lead from teammate Todd Gilliland on lap two and held it until pitting for four tires on lap 12 ahead of the stage break. 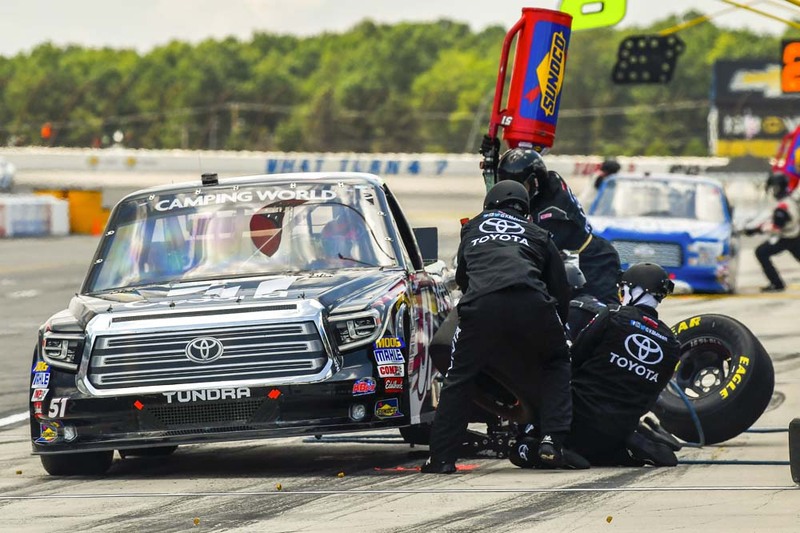 Busch was 19th when Stage One ended, but since he stayed out while most of the field pitted, he once again assumed the lead after pit stops were complete. Busch led for nine laps before pitting for four tires toward the end of the second stage on lap 27. He gained track position at the end of Stage Two when he stayed out and several trucks pitted. Busch was third when the final 30-lap stage began, but he did not stay there for long. He passed Dalton Sargent for the lead on lap 37 and never looked back. Having pulled away from the field, he crossed the finish line with a 1.5-second margin of victory over his KBM teammate Erik Jones. How special is it to tie the Truck Series victory record with your 51st-career win? 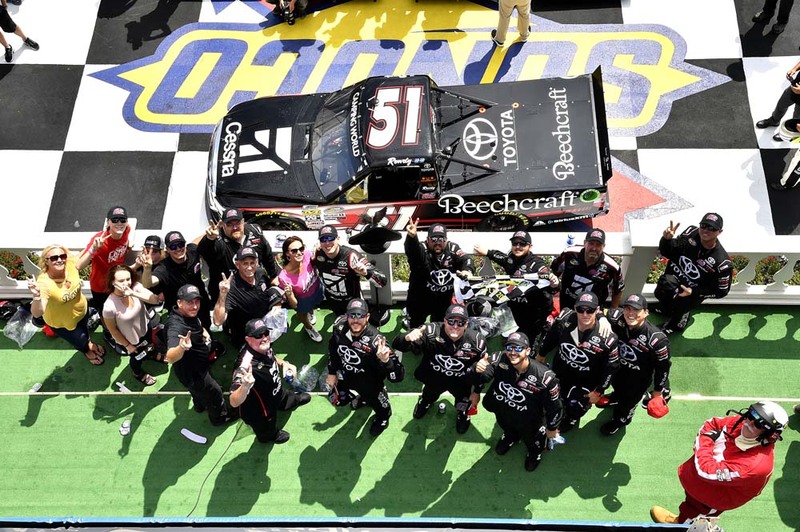 Busch won race followed by Erik Jones who was a substitute driver for KBM’s Noah Gragson who was ill, Dalton Sargent, Stewart Friesen and Justin Haley rounded out the top-five finishers. The race featured two cautions for a total of eight laps. There were nine lead changes among six drivers. Busch led 43 laps while KBM’s Todd Gilliland led seven and Erik Jones led one. The No. 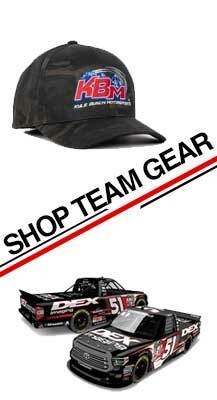 51 team remains third in the Truck Series Owner’s Championship Standings, 42 points out of first. Spencer Davis will be behind the wheel of the No. 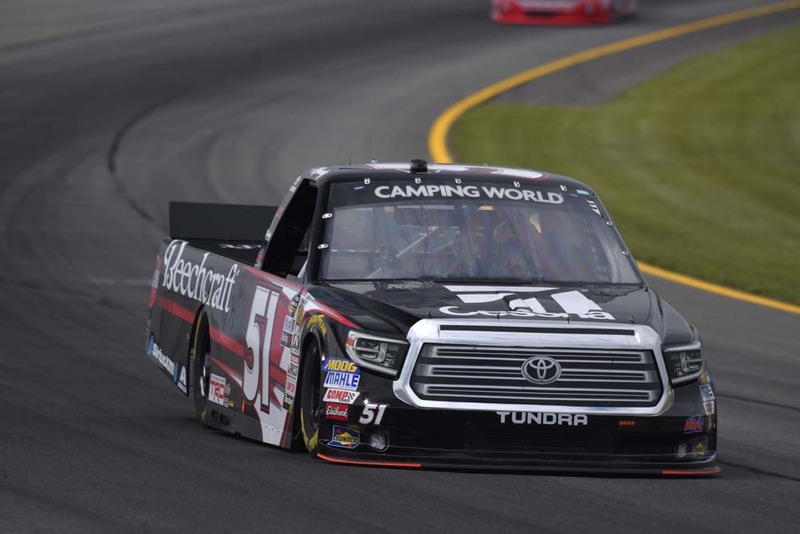 51 JBL/SiriusXM Tundra when racing action resumes in two weeks on Saturday, Aug. 11 at Michigan International Speedway in Brooklyn. Live coverage of the race begins at 1 p.m. ET on FS1.